Two national parks topped our agenda for today. We'd read very little about either so our expectations for Guadalupe Mountains National Park in northwest Texas and Carlsbad Caverns National Park in southeast New Mexico were pretty low. Apparently they're not too high on other park goers' priority lists either. Out of 58 national parks, only ten parks had a lower visitor count than Guadalupe Mountains last year. 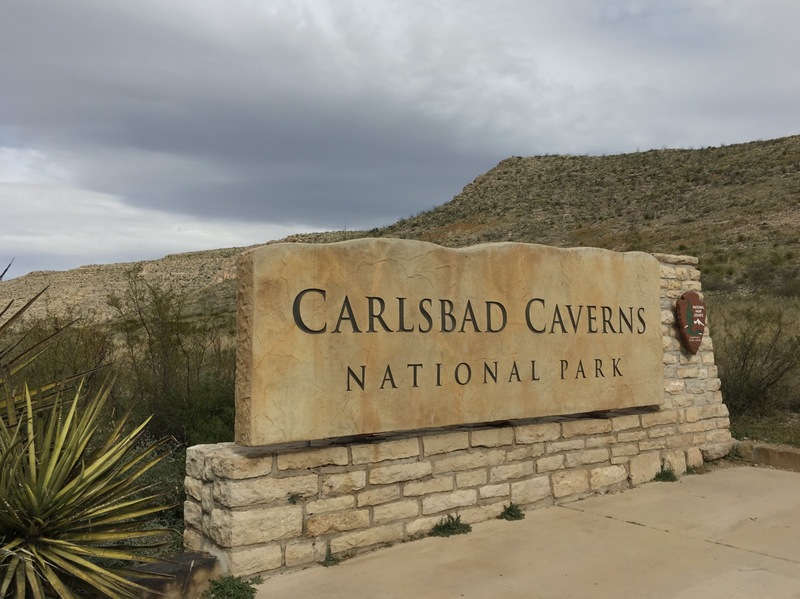 Carlsbad did slightly better with a ranking of 39th. 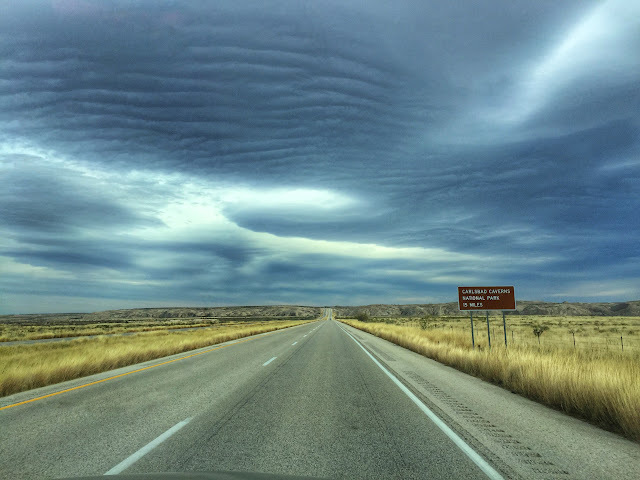 From Van Horn this morning, we set out on TX-54, a 55-mile connecter highway north from I-10 to US-180 near Guadalupe Mountains National Park. 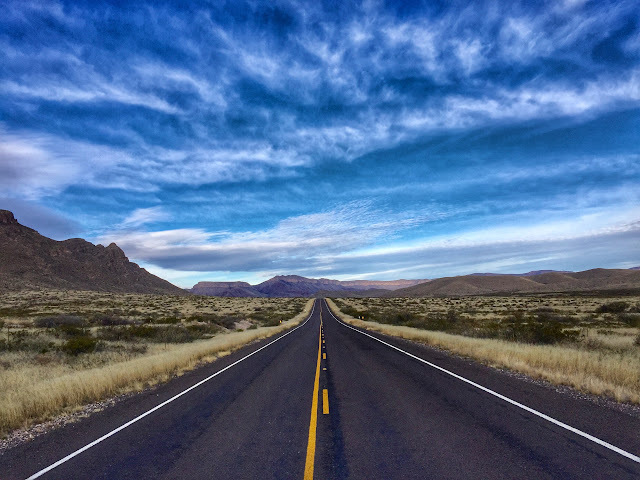 It's an isolated route that intersects no other highways and passes through no cities or even towns, but it's quite scenic as it traverses a gap between the Beach and the Baylor Mountains and moves north into a large salt basin. 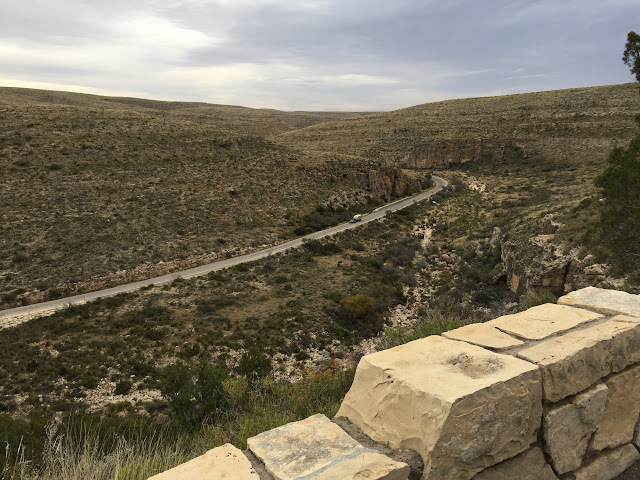 Where the state highway ended, the Guadalupe Mountains, which had been on the horizon, loomed into full size, and soon we were in the national park. EL CAPITAN HAS LONG SERVED AS A LANDMARK FOR TRAVELERS IN WEST TEXAS. The first impressive peak hovering above the highway was El Capitan (elev. 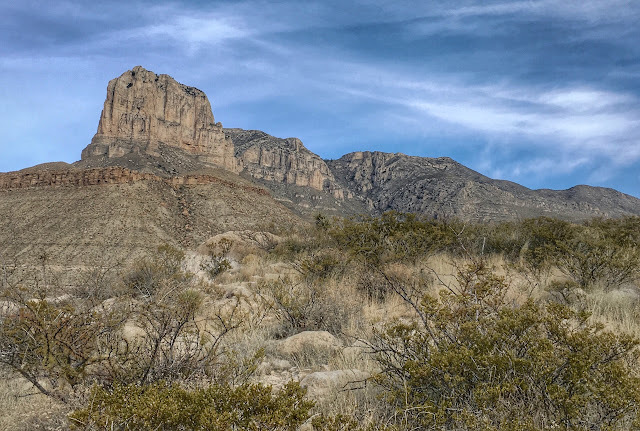 8,064 ft.) dramatically rising from the floor of the Chihuahuan Desert to assert its command of the area. A picnic area was strategically placed along the road with this magnificent view. We had no choice but to plant a letterbox there: Love This Spot #24. THE MATERIALS USED FOR THE SIGN CLEVERLY BLEND INTO THE SURROUNDING LANDSCAPE. Soon we were in the park proper and stamping our National Park passport at the visitor center. 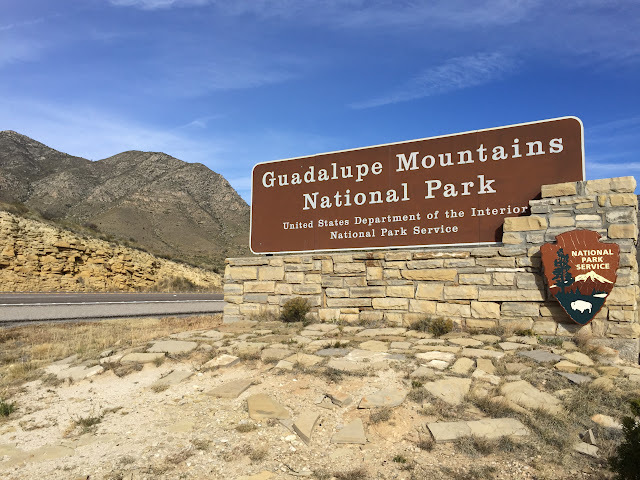 Thank you kindly for the information, Mr. Ranger, but we will not be hiking to the top of Guadalupe Peak (8,751 ft.) today. Not with winds gusting up to 35 mph. 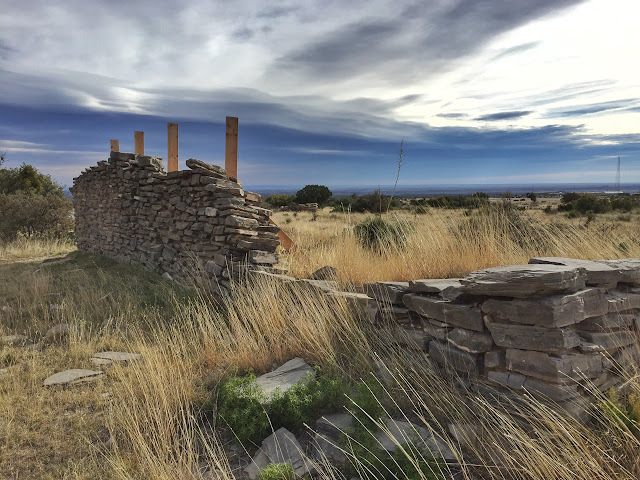 We stuck to the trails at the base of the mountains and checked out some ruins from an old stage coach station that was once a stop on the Butterfield Overland Mail Trail, predecessor of the Pony Express. 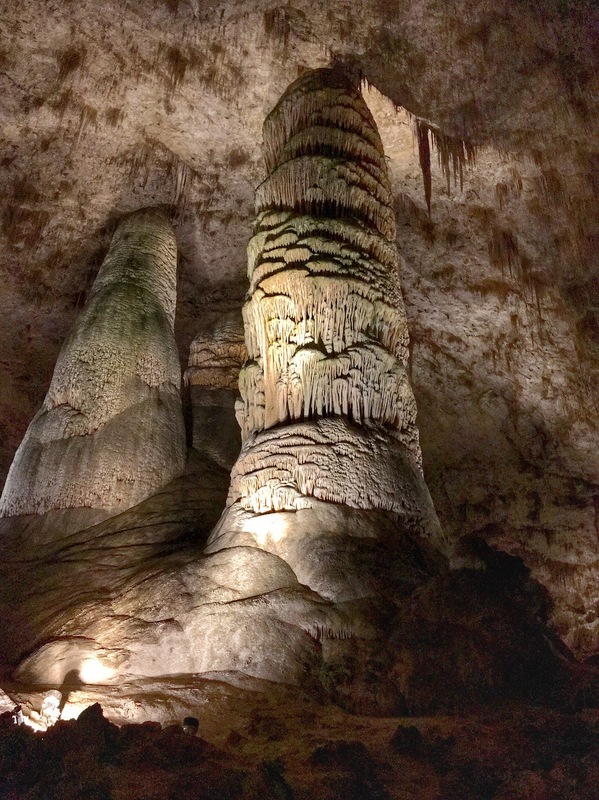 Adjusting our thinking about the value of these national parks, we left Guadalupe Mountains and continued northeast along US-62 about 30 miles to the entrance of Carlsbad Caverns. 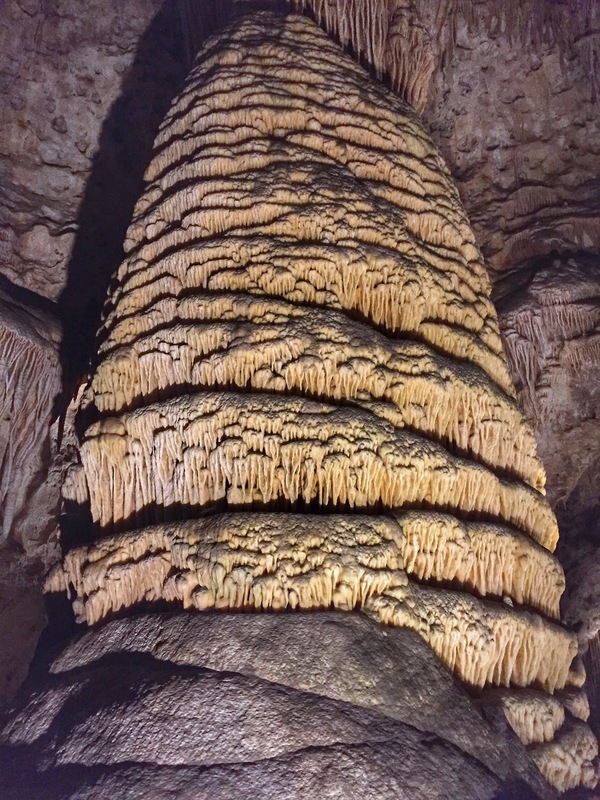 Having visited Kentucky's unadorned Mammoth Cave and other smaller caves in the past, we weren't expecting much. 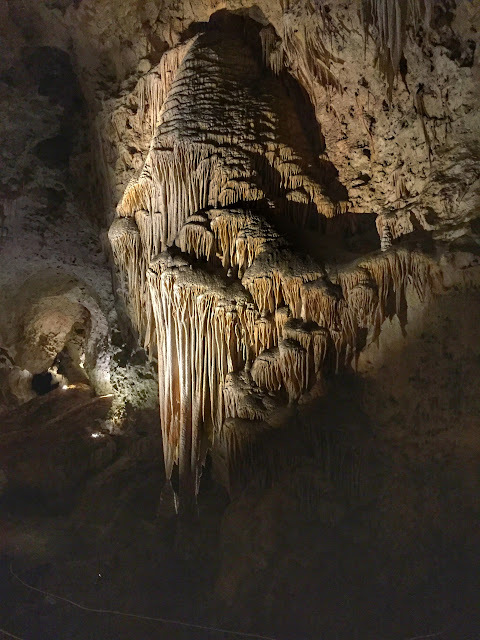 But it was near and we were there, so we dutifully checked in, showed our park pass and boarded the elevator that carried us 755 feet below to the cave entrance. We opted for the one-mile self-guided tour around the perimeter of what's called the Big Room. At 8.2 acres in size, it is considered the single largest cave chamber by volume in the U.S. It's bigger than six football fields, and in some sections the ceiling height exceeds 250 feet. 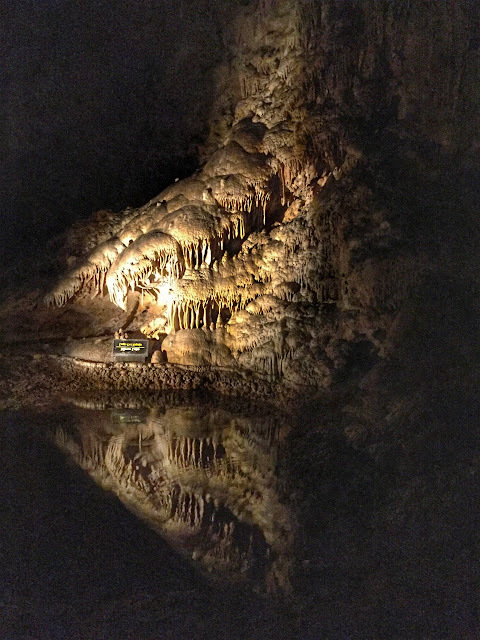 More than 1,100 LED fixtures spotlight various cave formations and colors. 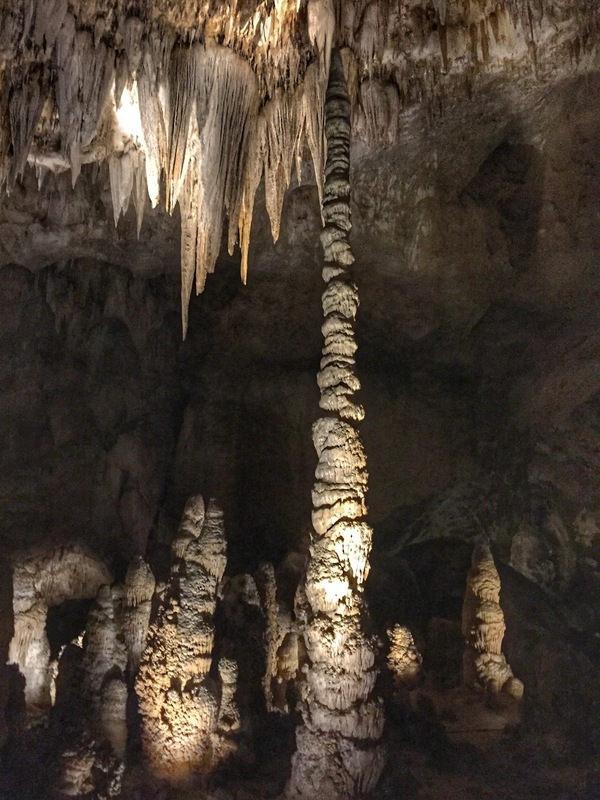 After a solid two hours of underground exploration, we hopped back into the elevator and shot upward to the earth's surface, glad to be back above ground and looking at the sky once again. But we were still marveling at the incredible artistic creations created by Mother Nature in the caverns. And we were so enchanted with this natural wonder we felt compelled to leave a Love This Park letterbox near the entrance to encourage others to visit. 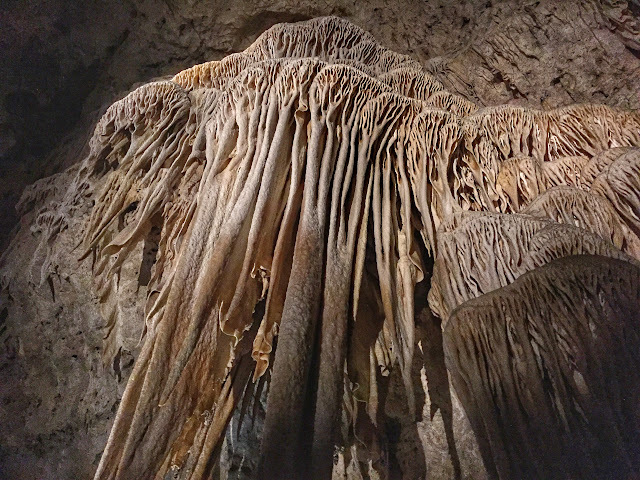 Interpretive signs educated visitors about the various types of limestone formations in the cave but one exhibit took us completely by surprise. 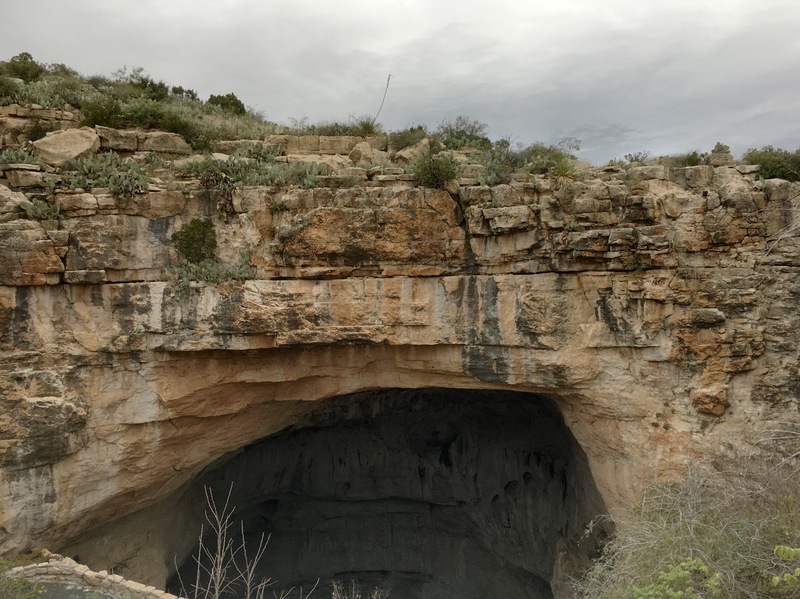 Hundreds of thousands of bats live in parts of Carlsbad Caverns, so, of course, the first explorers into the caves in the nineteenth century discovered deep deposits of bat guano. 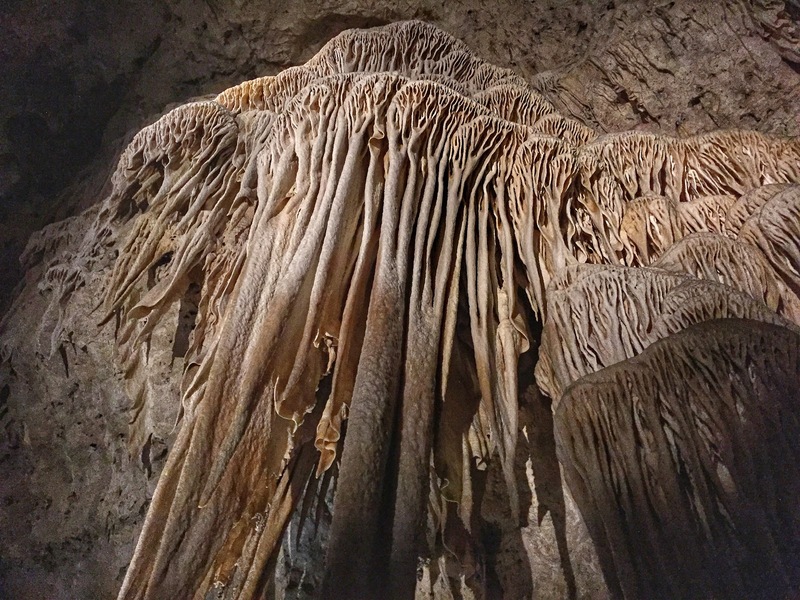 Apparently even then, it was known to be a natural fertilizer, rich in nitrogen, so someone staked a claim on the property and began harvesting the excrement and selling it to a California fertilizer company, which distributed it to eager citrus growers. 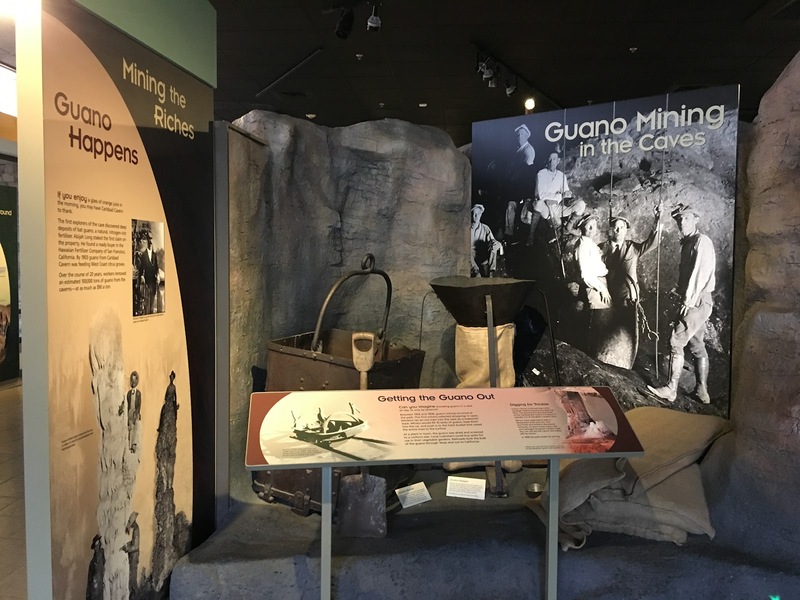 Guano mining continued in some caves until 1958. 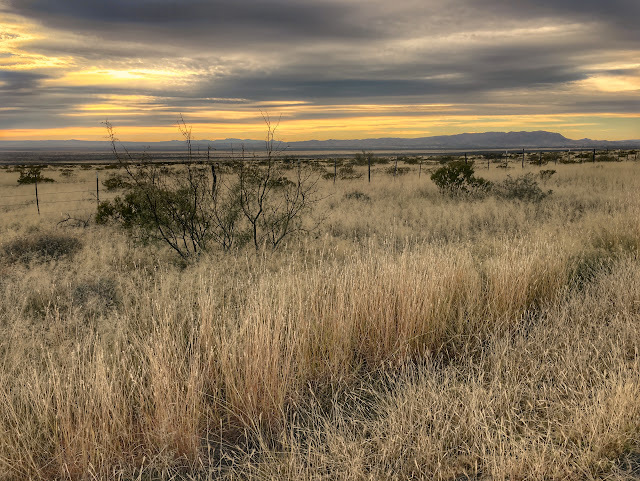 Following US-180 to El Paso took us back through the Guadalupe Mountains and over a long empty stretch of west Texas. 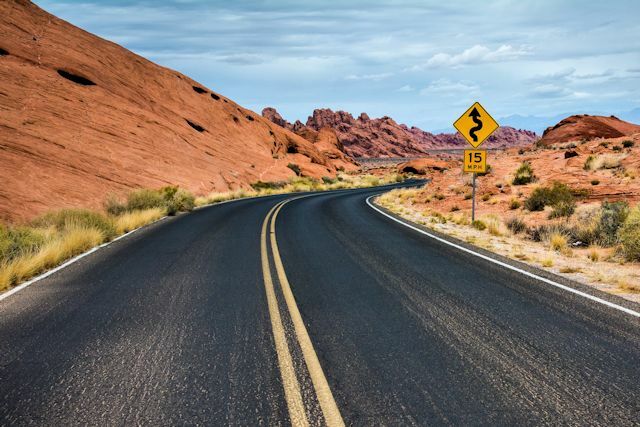 Along the 150-mile course, we passed through no inhabited places, unless you include the ghost town of Salt Flat or the wide place in the road called Cornudas with a population reported at 19, a number far smaller than the count of abandoned buildings along the route. We'll take a brief hiatus over the next few days as I fly east for a friend's funeral and Ken hunkers down with his laptop in El Paso to work on a couple of projects. On Sunday, we'll move into the bootheel of New Mexico. 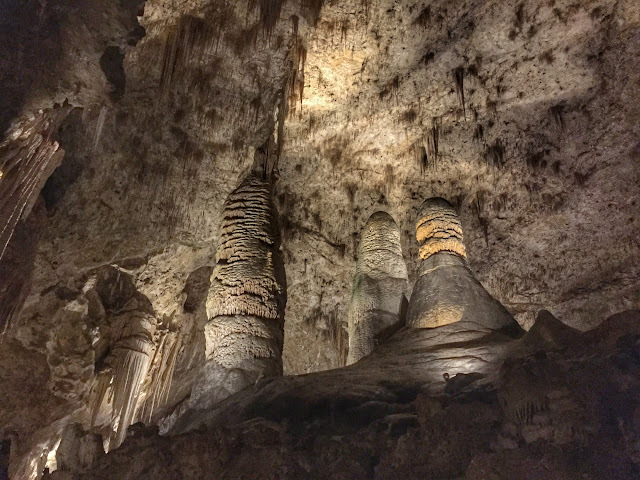 Loved: It's always fun when your expectations are exceeded, and both these parks blew us away with their scenic beauty and unique appeal. 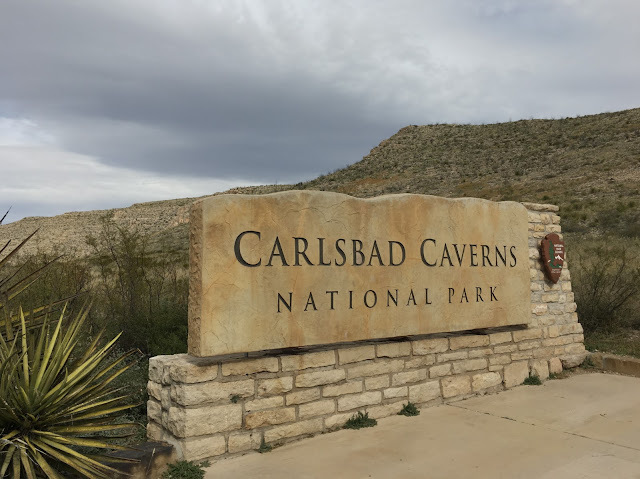 Lacking: Opportunity to hike more in the parks—due to high winds at Guadalupe and lack of time at Carlsbad. SUN PUTS ON A MORNING SHOW FROM OUR HOTEL IN VAN HORN. 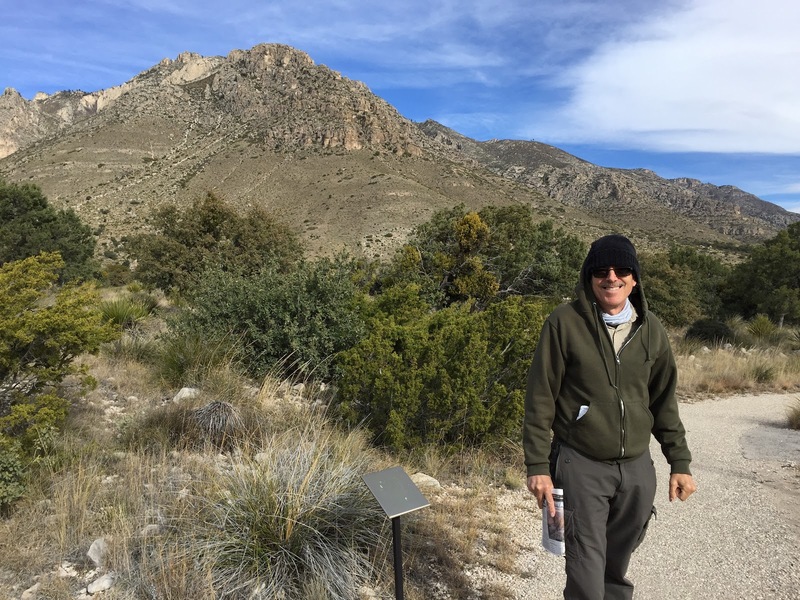 BRAVING THE WIND TO HIKE AT GUADALUPE MOUNTAINS PARK. WHEN A STALACTITE CONNECTS WITH A STALAGMITE, A COLUMN IS FORMED. 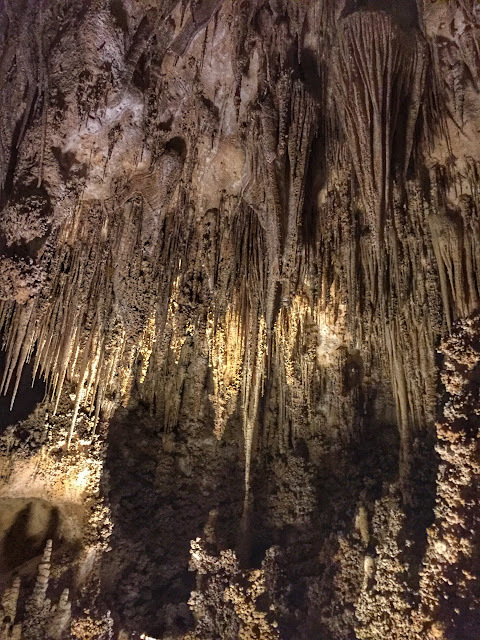 LIGHTING REVEALED THOUSANDS OF STALACTITES ON CAVE CEILINGS. SOME OF THE CAVERN FORMATIONS WERE REMINISCENT OF CORAL CLUSTERS. FOR THOSE WITH TIME AND STAMINA, YOU CAN TAKE THE NATURAL ENTRANCE TO THE CAVES.